We can thank the basic cable drama explosion for one thing: charismatic female movie stars chewing the scenery on a weekly basis. Sometimes flipping through the channels feels like a trip to the multiplex circa 1985. Count me among those who think that's a very good thing. 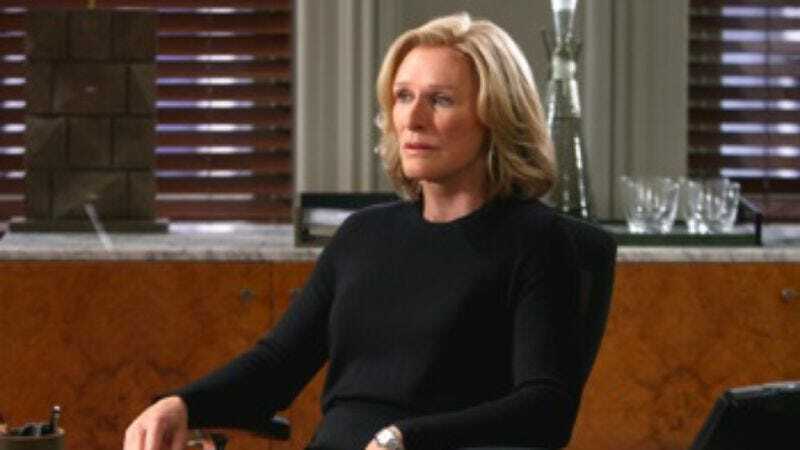 Last year's freshman FX series Damages puts Glenn Close in a role that combines the creepy craziness of Fatal Attraction with the maniac boss angle of her season on The Shield. Throw in Ted Danson playing against type as a villainous mogul, and I'm there every week. Sure, Rose Byrne was a bit of a cipher, but it's almost a given that the central actor in a show with such towering character roles can't do much more than lead the audience from plot point to plot point. Damages brings on ringer William Hurt to hulk around Season Two as a mysterious figure from Patty Hewes' past who contacts her for legal help. Hurt, as always, is a delight, a bundle of quirks and bizarre line readings that makes him seem completely unpredictable, whether he's sweeping papers off a desk or threatening an intruder with a fireplace poker. He's blowing the whistle on shady dealings by an energy company he's consulting for. But Ellen has another big case, handcrafted for her by the FBI as bait, that she wants Patty to snap up. And we also haven't seen the last of Arthur Frobisher (yay! ), whom Ellen finishes off with a shotgun in her fantasies. To no avail; Frobisher is recuperating from the bullet that his disgruntled employee pumped into his stomach. He has more problems than just his wounds and surgeries, though. Simple care from an orderly reduces him to tears. "I'm the most hated man in America, and you're being nice to me," he sobs. Frobisher was a fascinating villain last year precisely because he wasn't fully villainous — the scenes with his family were some of the most riveting of the show. Now we find out that his wife has left him and taken the kids, and he's weak, crippled, and consumed with self-pity. We also saw Patty's vulnerable side last season. Right away in this premiere she's being stymied in her charitable efforts by an important backer. Then she cringes away from a package that arrives at the office. "You open it," she hisses, as if it were a crucifix and she was a vampire. Memories of her evildoing last season wake her up from unquiet sleep. And she panics when she imagines Ray Fiske blowing the back of his head off multiple times in her office. The dynamic of Damages is the powerful versus the powerless, and the secret is that they are not different people. And despite what I said in the first paragraph about the problems with Rose Byrne's presence in Season One, that theme elevates her into a player that could be truly pivotal this season. Is she in control of the operation she's plotting to bring down Patty Hewes? Or is she being driven by demons and manipulated by her government handlers? - "Maybe, I'll tell you what, let's not shave. Let's not shave. And those tubes, I know I don't need 'em anymore, but maybe when she comes, we can stick a couple up my nose. Yeah, let's not shave." - Timothy Olyphant (whom you probably remember as the sheriff on Deadwood) shows up for his recurring Season Two role as a member of Ellen's therapy group who is also seeking revenge. Given his magnetic presence, he'll probably be taking the Ted Danson and William Hurt roles in thirty years, and wouldn't that be fantastic? - Now that he's losing his hair, the truth can no longer be hidden: William Hurt's head is shaped like the Alien Queen. - Glenn Close's hair is a lot longer this season, and I'm not sure what I think of the style. It's a lot less power-matron Martha Stewart and a lot more … Cheryl Tiegs? - Cross-cut of the night: Purcell begging Patty with his wife strangled on the floor, "Now will you help me?" to Agent Harrison (Mario Van Peebles) reassuring Ellen, "The important thing is, she took the infant mortality case."